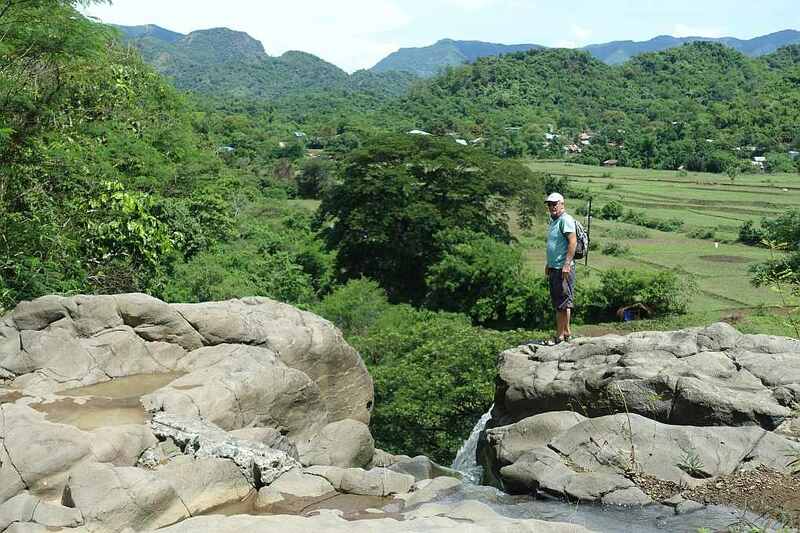 Pantoc Falls is, I think, the easiest waterfall to reach in the Province of Abra. Every day hundreds or maybe thousands of people pass within 350 metres of it without realising how close they are. Both the top and bottom of the Falls are easily accessible from three different entry points along the main road. 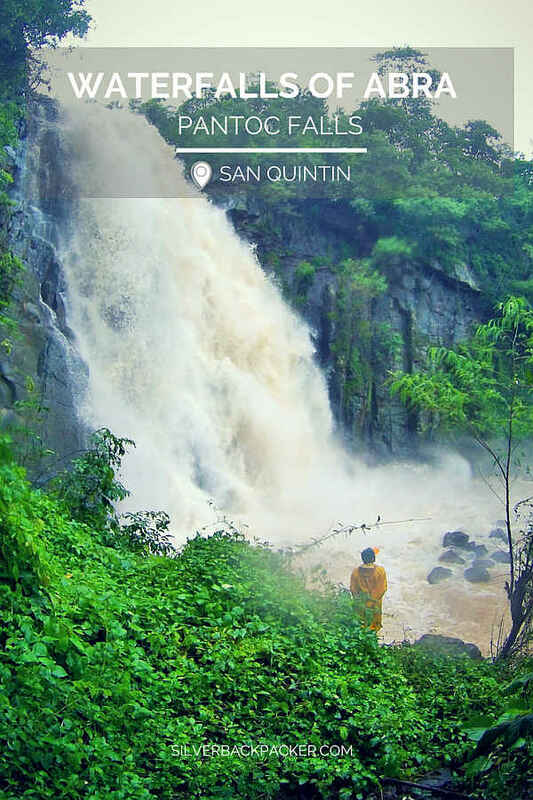 Pantoc Falls, also known as Pinsal Falls because of its dual water drop, can be found just off the Abra – Illocos Sur Road in Barangay Villa Mercedes, San Quintin. 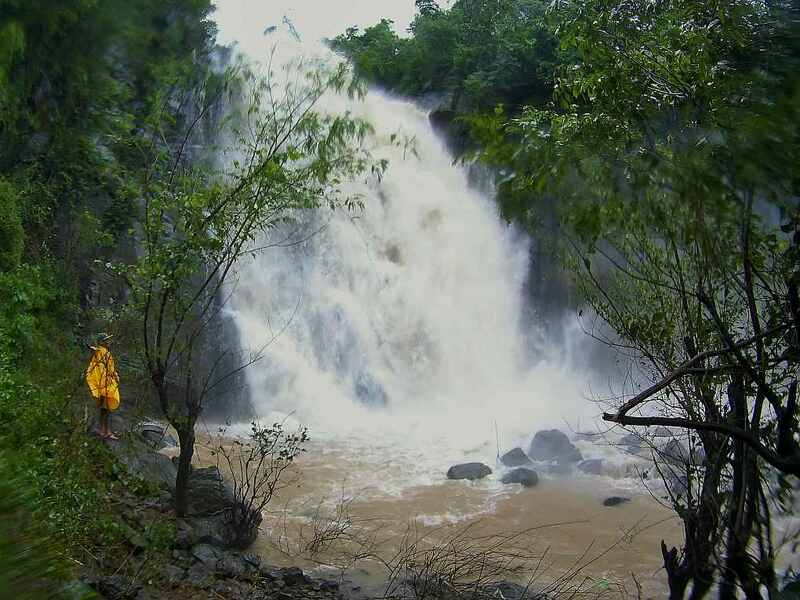 In fact, Pantoc Falls is the first waterfall in Abra after you enter the province through the Tangadan Tunnel. The top of the Falls is used by local washer-women to launder their clothes and other textiles, as well as Carabao ( water buffalo ) cooling down after a hard days work in the adjacent rice fields. School children also run down here to play during their lunch break. The basin at the bottom of the 30 metre drop is very shallow and not good for swimming, although the black rock face can be climbed in places. 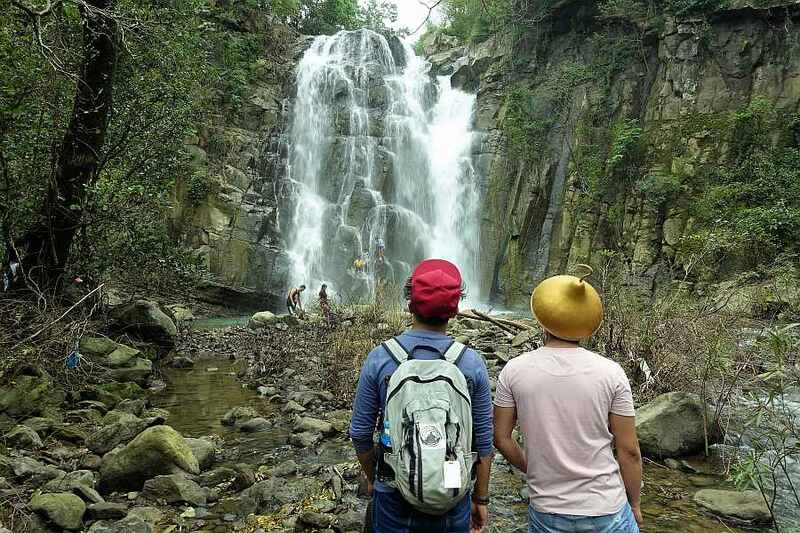 Recently Pantoc Falls was used as a setting for a scene in a documentary on the Life of Tata Pilo ( Teofilo Garcia) the local Tabangaw Hat Maker from San Quintin and a National Living Treasure Awardee of the Philippines. There are no signposts indicating that the Falls are nearby, so we need to recognise the landmarks that will lead us to them.See the pointers below. 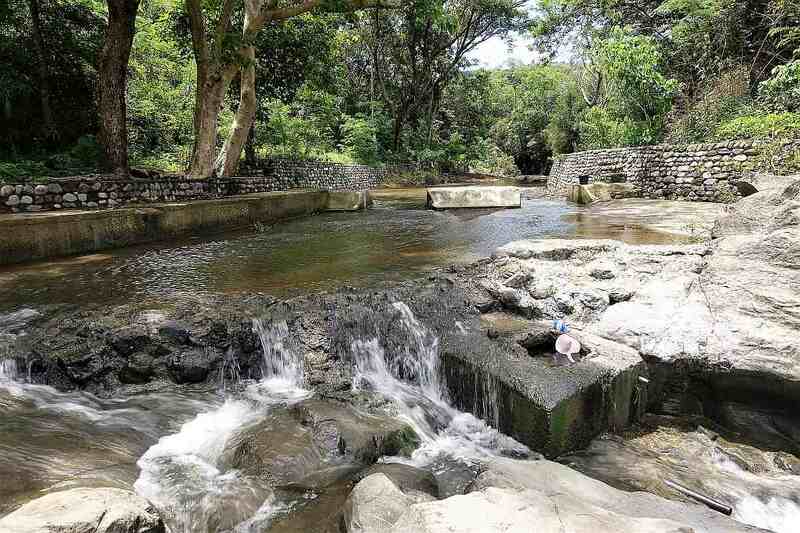 Let’s start with the most popular way to reach Pantoc Falls, the bottom entrance. The key is to spot the Yellow House just after entering Barangay Villa Mercedes. Coming from Bangued it will be on your left before the covered basketball court and from Tangadan Tunnel on your right just after the basketball court. After spotting the Yellow House and alighting your transport, cross the road and you will find a single track road which will lead to the river which flows from Pantoc Falls, just 10 minutes walk away. If it is the rainy season and the water level is high do not attempt to cross the river as there are two more ways to reach the Falls. If the river is safe to cross then carefully wade over to the other side whilst enjoying a first view of the black rock face of Pantoc Falls from the middle of the river. Once safely across, follow the path by the rice field to the Falls. As you drive along the main highway to or from Bangued, pay attention to the yellow Kilometre Posts on the side of the road. The top of Pantoc Falls is reached from Kilometre Post 392. There is parking near the 5Ps Store. The trail to the top of Pantoc Falls starts behind the Store and leads down to some rice fields a short 5 minute walk away. You will soon hear the sound of rushing water and will find a concreted area that is used by the local washer-women to launder their clothes. 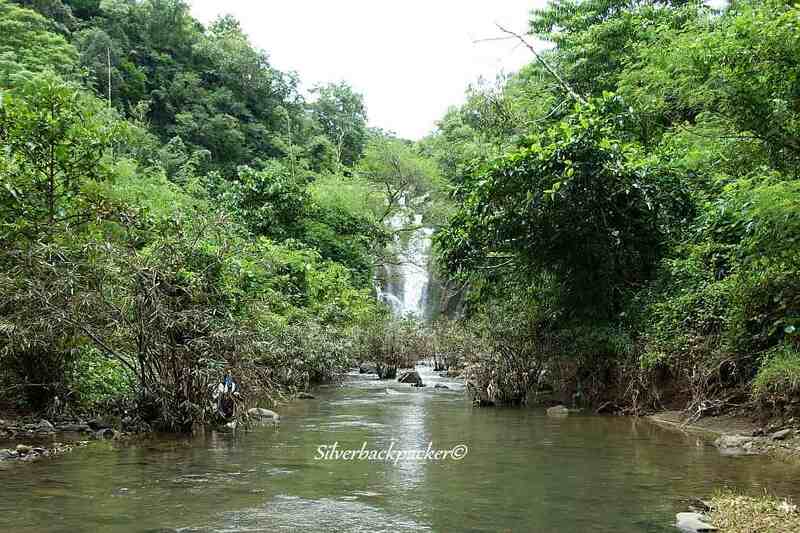 There may even be some carabao enjoying a soak in the cool water. Venture carefully onto the rocks at the top of the Falls for an excellent view of the surrounding countryside. Don’t do this if the river is fast flowing as there is a danger of being swept away. If you are able to cross the river you will find an irrigation channel and if you follow it downstream there are some great sideviews of the Falls. Walk carefully further along the irrigation channel and soon you will see on your left a narrow trail leading downhill, which will take you to the lower level basin of Pantoc Falls. There are three ways to return to the main road. 1. Turn right at the bottom and follow a trail back up to the road when you are finished and then walk back downhill to the 5Ps Store if you have left a vehicle there. 2. Climb back up to the irrigation channel and return the way you came. 3. Walk along the rice terrace to a big tree by the river, cross the river and follow the trail back to the road by the yellow house. Turn left at the main road and walk uphill to the 5Ps Store to return to your vehicle. The trail will take you straight to the bottom level of the Falls. Its best to use this trail if the river at the Yellow House trail is too high or dangerous to cross, for example, if you want to see the raging waters and feel the hurricane like winds of Pantoc Falls after a week of rain or after a typhoon has passed. I took this trail, after being unable to cross the river on the Yellow house trail back in August after a week of heavy rains, and it was an experience. I wasn’t prepared to see this much water and feel the strong force of the wind generated by the torrential flow of the Falls. It’s worth knowing this path as a back door to witness the powerful forces of Nature at work. Pantoc Falls in normal flow has twin falls cascading into the shallow basin. Pantoc Falls after a week of rain has a full flow of raging waters that continue on their way to the Abra River. From Bangued, take a tricycle to the jeepney terminal in Zone 5 near the Shell gas station. The trip takes around 30 to 40 minutes and the fare is P25. Leave Bangued on the road to Ilocos Sur. Drive through Pidigan and keep going until you come to Brgy Villa Mercedes and a yellow house on the left side of the road or the covered basketball court, which is a bit further down the road. 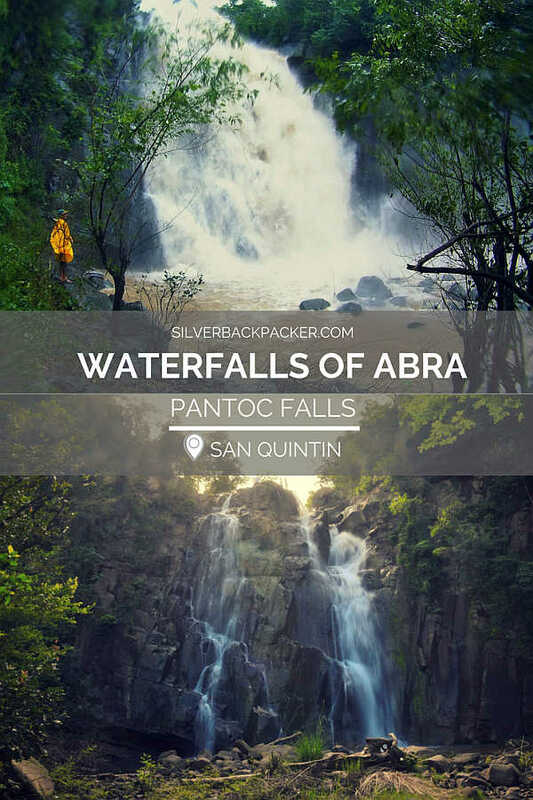 Did you like “Pantoc Falls, San Quintin | Waterfalls of Abra” ? If so then please share this page with your friends.